Supermarket giant Sainsbury's is to create 3,000 shopfloor jobs as part of a revival strategy aimed at boosting sales by £2.5bn over three years. 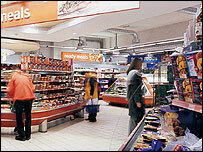 Chief executive Justin King said the firm would return to focusing on food and try to keep shelves better stocked. The UK's third-largest food retailer, which has been hit hard by competition, will also cut 750 head office posts. The company will take a £550m ($991m) exceptional charge this year and its final dividend will be halved to 7.8p. 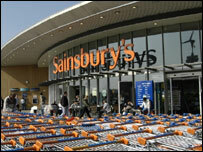 The £550m exceptional charge to cover restructuring costs will drag Sainsbury's into a net loss for the year. But the supermarket said second-half underlying profits will not be "significantly different" from the £125m-£135m forecast for the first six months. Once an industry leader, Sainsbury has lost out in recent years as rivals slashed prices. Tesco now dominates the UK supermarket sector with a market share of 28%, followed by Asda with 16.9%, with Sainsbury trailing behind at 15.3%. Sainsbury's has issued three profit warnings this year as problems mounted, and since the start of 2004 its shares have underperformed rival food retailers by 23%. Under the catch line 'Making Sainsbury's Great Again', Justin King plans to revive the ailing retailer by getting back to basics and focusing on selling food. Sainsbury's is also looking to make cost cuts of at least £400m, with the savings used to allow price cuts on the food shelves to compete effectively with its rivals. The firm said it was aiming for a sales-led recovery and hoped to boost turnover by £2.5bn over three years. It will close 12 stores, refurbish 131 outlets from its estate of 461 supermarkets, while suspending the roll-out of its petrol station convenience shops. "We've laid out a plan of three years and said we'll see sales recovery in the second half of next year," Mr King told the BBC. Commenting on the head office job cuts, Mr King said: "Retail is a simple business. We've made it much too complicated. "There are too many people creating that complexity. We're going to have a slimmed down central function that focuses on serving our colleagues in stores." To get some idea of how to please its customers, Sainsbury wrote to a million customers asking what changes they wanted from the chain. A quarter of a million replied and the firm said the message from the public was to get back to basics. The company's new strategy contrasts with that of Asda and Tesco whose profits have been fuelled by an aggressive roll-out of non-food products such as clothes and CDs. Adding to Sainsbury's recent woes was a disastrous decision to sink £3bn into supply-chain and IT improvements - a move which was overseen by its former chief executive Sir Peter Davis. But instead of boosting productivity, problems with the system meant it fail to deliver, leading to low morale among staff, the company said. According to analysts, the supermarket chain has suffered from lack of investment over the last decade and a half. "The issue with Sainsbury's dates back a long way to 15 years ago, back to the level of under-investment in infrastructure compared with Asda and Tesco," said Justin Urquhart Stewart of Seven Investment Management. But analysts say the firm is not beyond hope. "It is not a basket case at the moment, just a disappointment," said Hilary Cook of Barclays Stockbrokers. Overall, analysts were unimpressed by the group's review plans, with many investment banks keeping a 'sell' tag on Sainsbury's shares. One described the company's turnaround plans as "brave" but reckoned its strategy would take years to bear fruit. Sainsbury's shares closed at 249 pence, up 2.9% on the day.